Stop having boring corporate activities – take everyone paintballing. If you’re sick of the stock-standard corporate team building exercises – try playing paintball. It is ranked as one of the leading sports activities for corporate events, and for good reason. It’s a game that will get you thinking strategically, and as part of a team. Teamwork is crucial to achieving victory, and the stakes are high. No one will want to be beaten by the boss. Our immersive game zones are purpose built, and will impress at any corporate or Christmas function. Don’t believe us? Check out our game zones page and see how incredible our centre really is. 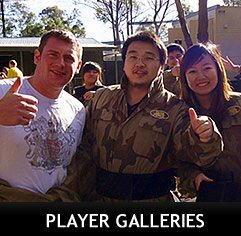 Paintball is a game that requires great communication and team work amongst players – something that will foster good relationships in the future. Do you think your office is up to it? A game at Delta Force Paintball. You’re on our Tomb Raider game zone. You’ve hidden behind the pyramid. You can see the opposing team trying to sneak up on you, but they’ve made too much noise. You skirt around the pyramid, silently watching as they enter the pyramid, thinking they have you cornered. Your team mate and yourself jump into the entrance, blocking the team in and releasing a barrage of paintballs. Watch out for back up! Their back up arrives, but you have enough time to commando roll behind the sphinx. You spot the treasure by the sphinx across the entrance. Your team mate covers for you as you sprint to the treasure, scooping it up on your way past. Now all you need to do is make it to the drop-zone and your team will win! Are you ready for the commitment, and possible sacrifice required to achieve victory? Have a day your team will never forget. There’s no better sport to foster teamwork and develop new relationships, in such a short period of time. There’s no tacky games here – just outright fun at Delta Force Paintball Newcastle! Gather the team, and get ready for an epic day of paintball action.